Originating in Newfoundland, this large, heavy-coated breed is a workhorse among dogs. Along the cold coast of Canada, Newfies were tasked with many jobs, including carrying heavy loads as pack animals, and towing ship lines. They are well known for their instinctual ability to rescue distressed swimmers from the water. Beyond hard work and heroism, the Newfoundland is known for his gentle, friendly nature, his wise expression, and his endless patience with children. If you have the room, Newfies make exceptional family pets. Though he is massive, he has a lap dog's spirit and will snuggle close with his people at every opportunity. Newfoundlands are also commonly called Newfies. Coat - Newfies have a dense, thick double coat. The undercoat is soft and insulating, while the mid-length outer coat provides water resistance. The breed sheds much of its undercoat during the warm season. The most common coat color is solid black, but Newfoundlands can also be brown or gray. A landseer Newfoundland has a white base color with large black patches. The Newfoundland is a giant breed dog whose thick coat makes him appear even bigger. Newfies are strong and muscular enough to haul heavy loads, yet have a smooth stride that covers a lot of ground quickly. Their strength and webbed feet make them excellent, fast swimmers. The Newfoundland has a massive head with gentle, intelligent eyes exuding an appealing, dignified quality. The Newfoundland is a descendant of dogs brought by fisherman from Europe to Canada, though their exact lineage is unclear. The breed's ancestry may include Great Pyrenees, French Boarhounds, and predecessors of Huskies, but this is speculation. Whatever their bloodline, Newfies developed into powerful working dogs, who were well-adapted to cold weather and waters, and were wonderful company to boot. They were used as draft and pack animals to pull lumber, carry food, and haul other heavy burdens. They were also ship dogs who towed lines through icy, choppy waters from ship to shore. Newfies drew fame around the world as word spread about their natural instinct to rescue drowning swimmers. This strong dog was so admired, he was eventually brought back across the Atlantic to England and bred extensively there. Most modern Newfoundlands are thought to be relatives of this English stock. Newfies are among the sweetest tempered of all dogs. True 'Gentle Giants,' they are endlessly patient and loving. Are Newfoundlands Good with Kids? Newfoundlands are so well known for their patience with kids they are sometimes called the 'Nanny Dog.' The character 'Nana' in Peter Pan was a Newfoundland charged with caring for the Darling children. Are Newfoundlands Good with Other Pets? Newfies are loving and gentle with other pets, though their size can cause unintentional injuries to very small dogs and cats. Newfoundlands will protect their families when under threat, placing themselves between their loved ones and danger. Are Newfoundlands Good Guard Dogs? Newfoundlands don't tend to bark a lot, but they will raise the alarm if they sense trouble. They are also famed for towing distressed swimmers to safety. Though their size can make them appear lumbering and low-energy, Newfies have a spring in their step when needed and love to work. Require extra space to move around because of their large size. Prone to heat exhaustion in warm climates because of their thick coat. Require a lot of exercise to be physically fit. Can't be left alone for long. Indoor Because of their massive size, Newfoundlands are not ideal pets for small apartments. They can adapt to larger apartments as long as they are given plenty of opportunities for exercise. They want to be near you as much as possible, so expect to have a companion with you most of the time during your daily routine. If you're a neatnik, Newfies are not for you because they are heavy shedders and droolers. Outdoor Newfies enjoy working and playing outdoors, but they shouldn't be left alone outside for long periods of time. This breed thrives when he is to his people, and is also at risk of heat exhaustion if left outside when it's warm. Exercise Muscular Newfoundlands need moderate amounts of exercise every day. Two long walks and a long game of catch will keep this breed in prime condition. Newfies benefit from access to an enclosed back yard. Endurance Bred to work hard, Newfies can haul loads or hike for hours in cold climates. If it is hot or humid, keep your Newfoundland in the air conditioning and play fetch indoors. Running Miles: Because they are prone to overheating, constant running is not healthy for Newfoundlands. Hiking Miles: This breed will take a three- to five-mile hike with you, as long as temperatures are cool. Always watch your Newfie closely for signs of heat-related illnesses. Food This big dog requires four to five cups of quality dry dog food each day, split between two meals. The exact amount will vary depending upon your Newfie's activity level and age. Talk to your veterinarian about the optimal diet for your dog. Alone Time Newfies are prone to developing separation anxiety. It's best to sign up your Newfoundland for dog daycare if you can't be with him, so he doesn't get lonely and develop destructive behaviors. The thick, double coat of the Newfoundland requires daily brushing to get keep it healthy, prevent matting, and manage shedding. In a warm climate, or during the summer, consider cutting your Newfie's coat short to help him stay cool; bathe him about once a month and brush his teeth several times a week. Be sure to trim his toenails every few weeks. 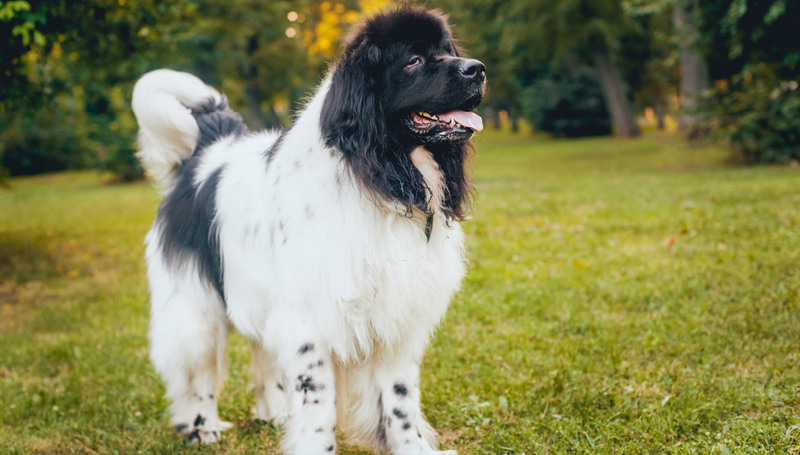 You can minimize serious health concerns in a Newfoundland by purchasing from a reputable breeder who engages in responsible breeding practices, and through screening for common diseases and conditions. The highly intelligent Newfoundland is an excellent student and a fast study when it comes to basic obedience commands. Newfies like to be active and engaged, so they are excellent candidates for canine sports and agility courses when the weather is cool. This working dog is not suited to hunting. No. Newfoundlands have a lot of fur and they shed. As a result, they will cause a buildup of pet dander in your home, which is the cause of most pet-related allergies. Yes. Newfoundlands drool copiously, especially after eating and drinking. It is wise to keep a drool towel handy to wipe your Newfie's mouth occasionally. Yes. This giant of a dog sheds abundantly.